We left mainland Spain and flew to the Island of Mallorca with the sole purpose of visiting our friend Archie! Because of the way that the flights worked out however, we had a full six days here, and it also grew into quite a relaxing respite from constantly packing up and unpacking, and moving around the continent. Mallorca was our beach getaway and Archie was our guide. Archie has spent the last several years traversing the globe, including South America, Europe, and Southeast Asia. This time we found him teaching English here on an Island in the Mediterranean. It’s obviously a cushy job, giving him unrestricted access to the local culture and leaving him plenty of free time for other pursuits. He's pretty much living "the life." The capital Palma has plenty of young people and lots going on, but one of his great insights is that in Spain, friend groups are very cliquish and difficult to break into. Without the sort of access that he get's through teaching English, it can be tough. Because so few people leave the place of their birth, groups are more or less set in stone from an early age. As an outsider, it can be alienating, and even having befriended one individual, it’s then a chore to seek full group acceptance. This phenomena is so ubiquitous that you see it reflected in the advertising here, with fast food chains offering specials for friend groups to share. This is something that even the locals themselves admit, and it’s a tough audience to hack. The Island itself however, is a gem, and especially at this time of year. There’s a hot breeze that blows through the port and up the streets bringing with it a sticky humidity which numbs the senses and calms the mind. The sun beats down and gleams off of the glass of the few high-rises lining the beach strip, and a cement walkway lined with palms traverses the long stretch of bay. You could be mistaken for thinking that you’re in Miami, at least until you walk past the titanic-sized red stone cathedral whose high flying buttresses and columns give it the impression of being a giant overturned stone ark. It’s then that you recall that this is indeed old and historied Europe. Make no mistake, Mallorca is an ancient place, and has changed hands many times, being ruled by the Moors and most recently, Spain. The capital Palma is certainly old but with the influx of tourist money it can afford to feel like a posh little resort town with plenty of boutique shops. Eve deemed the shopping culture in terms of what we saw available here to be superior than that of Paris. During the height of the tourist season, things can get pretty out of control and it becomes a party-town, and one of our drivers warned us about UK tourists and their proclivity to get raving drunk and try to jump from rooftop to rooftop. This led to several deaths this last season. They’re compelled to jump, we supposed, because the rooves are so high and so tightly packed as to appear almost inviting. Everything in town is constructed upon the ancient floor plan of the city’s original builders who did not have cars or probably even street maps in mind. The curvaceous avenues and alleyways meander in what appears to be an almost random fashion and if you’re not careful, they’ll lead you in endless circles. It’s as if the bricklayers were trying to lose someone who was pursuing them, dodging left and right frantically, laying cobblestones as they went. The result is that you can walk for a half an hour and then suddenly recognize the same bakery you just left. We actually did this, and in the warm and salty weather we were of the mind to simply sit down again, have a second coffee, and accept our lovely fate. An odd positive side-effect of this spiderweb urban design is that you do a lot more exploring that you might otherwise, and you run across a lot of incredibly interesting graffiti smeared across the backstreets of Palma. After a few days, we had to get out! 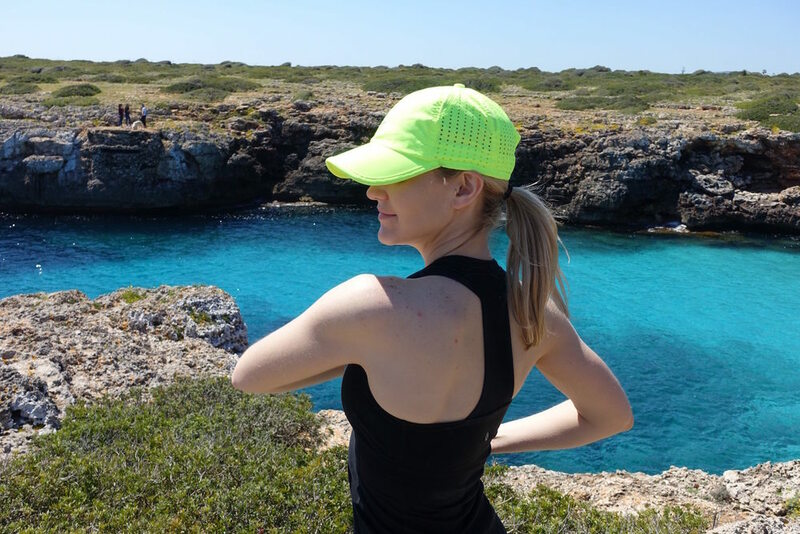 The Island was beautiful and refreshing and HOT so we took a bus to go hiking on the Northern shore and we got a taste of rural Mallorca. Once outside of the capital, I have to say that it felt immediately like South America. Spanish cantina music was being played on the bus whose AC was shot, the land we whizzed past was a dark red earth dotted with vibrant green trees, and the dwellings were boxy cinderblock compounds with adobe-tiled grooves. Wild yellow flowers, foxtails, and paddle cacti grew all about. The only clear differentiator in my mind were the stubby little iron windmills, no more than ten feet tall, resting upon each property in varying levels of neglect. The stark similarity to Argentina’s pampas was interesting to me. While I’m sure that as a tourist I’m missing plenty of details but to the untrained eye, no matter where you are in the world, rural is rural. There's such an amazing convergence of structures that are common to all human dwellings in this type of arid environment. They’re always cinderblock or cement four-walled houses with a modest little waist height cinder block fences. There are always trees for shade, satellite dishes, cars, farming equipment, and tilled land. This could just as easily be Thailand. Or Vietnam, or Mexico, or Peru. Everywhere, we’re all just people with the same basic needs and a pretty similar ways of going about meeting them. On our hike we traversed the sharp volcanic cliffs to the North and I took some pictures that I’m incredibly happy with. We kept seeing crumbling cement bunkers dotting the Island’s edges, and finally realized that we weren’t able to find any of them from above because they’re so well hidden. They’re cleverly buried in the rock with a single upper hatch, all left over from Spain’s civil war in the 1930’s. Below you'll see what we saw when we ducked inside. Mallorca was a great reprieve, it was great to catch up with Archie, and now we’re on to Rome!